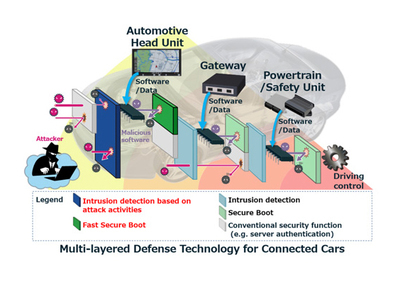 TOKYO - January 22, 2019: Mitsubishi Electric Corporation has announced that it has developed a multi-layered defense technology that protects connected vehicles from cyber attacks by strengthening their head unit’s defense capabilities. The technology will help realize more secure vehicle systems in line with the increasing popularity of vehicles that are equipped for connection to external networks. Vehicles with communication functions provide connections to the internet and/or mobile devices such as smartphones. The importance of cyber security is increasing because these vehicles are vulnerable to cyber attacks and even malicious remote control in extreme cases. Mitsubishi Electric’s new multi-layered defense technology prevents cyber attacks through a variety of robust security features, including an intrusion detection system without high-load processing and a secure-boot technology that quickly verifies software integrity during the boot process. 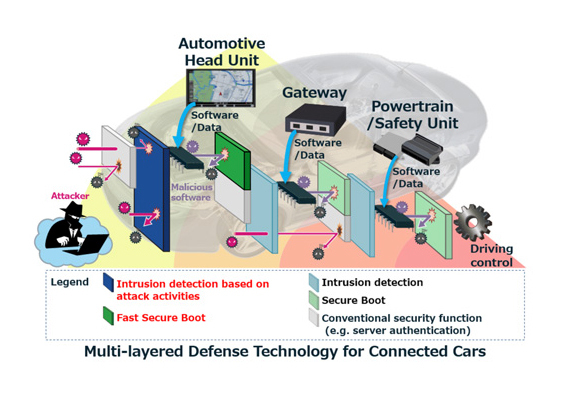 Mitsubishi Electric’s new multi-layered defense technology achieves robust security of the vehicle by strengthening the security functions of the automotive head unit, the vehicle’s main link with the internet. The developed technology is adapted from multi-layered defense technology originally developed for critical infrastructure, such as systems for electric power, natural gas, water, chemicals and petroleum, for vehicle systems while requiring only limited machine resources.